A nice medium rare cook also made me happy. And find out I did. The first thing I wondered was how it would stay together. 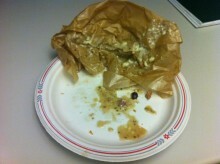 For starters, this wasn’t some soft, melty Krispy Kreme donut, but a thick grocery store-style breakfast sweet. 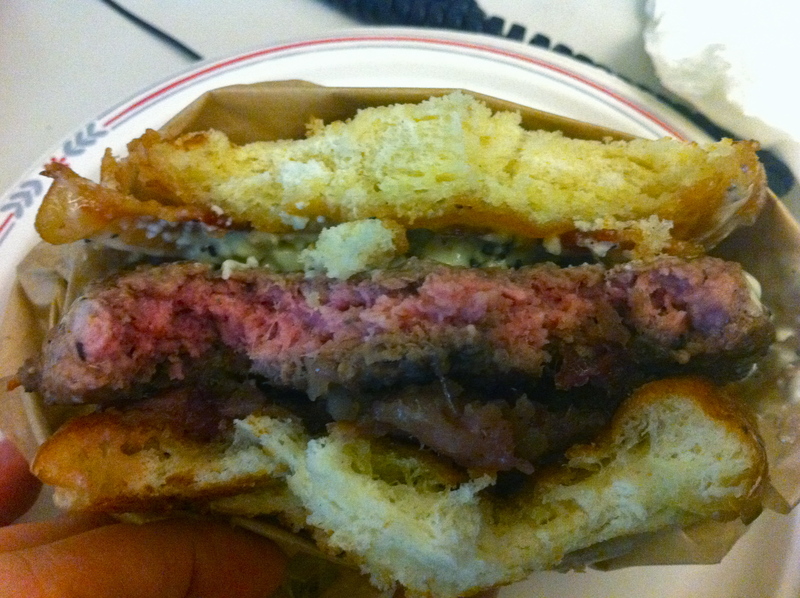 It was still wildly inadequate at holding together a burger, especially when you throw the donut hole in the mix, so the make up for it the burger was wrapped in paper. 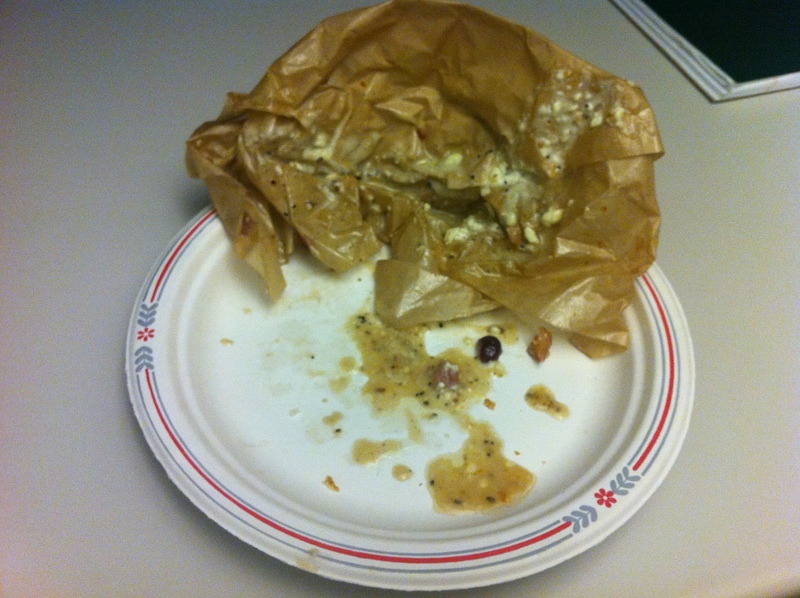 Nonetheless, this was nothing less than a mess to eat. The next thing I wondered was how I would handle the sweetness. Not only was there donut, but also fruit reduction to consider. And the truth is that the sweetness was a bit much. 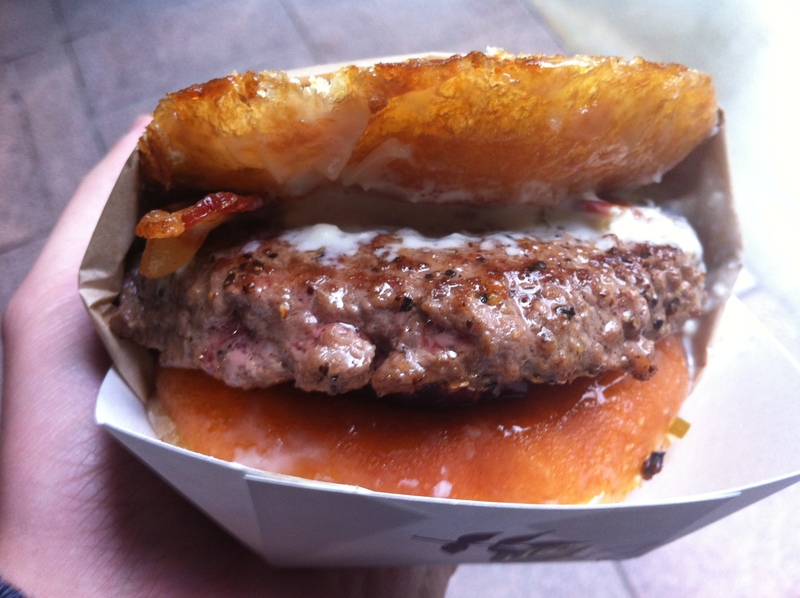 There was certainly a lot of savory between the bacon, patty and blue cheese, but this was not enough to counter the fruit and donut punch. My suggestion is to either swap out the glazed for old fashioned donuts or to drop the fruit. I can’t say whether either would work, but I do know that either way would be less sweet. I had to move it from a tray to a plate because IT COULD NOT BE CONTAINED. But who am I kidding here? Is The Patrolman really seeking out the perfect blend of burger balance? Oh dear I hope not. This burger represents America and our undying dream of gluttony and excess. In that regard, this burger is a major success. Yeah, I can get finicky with the details, but in the end, Da Burger Boss delivered a pretty good, juicy burger and topped it with an obscene bun. And I annihilated it. In other words, it was glorious. I should also point out that Da Burger Boss in no way invented the glazed donut bun. This was something I had heard about before and Da Burger Boss is simply the first I had ever actually seen. That burger looks pretty epic. I saw something like it once before they called it the Luther but it didn’t have a big nice patty like that. I must find this Patrolman. Legend has it that it is named after Luther Vandross, but that legend comes from Wikipedia, so I’m not sure how much I believe it.